I’m still kind of at a loss for how to approach Monster Hunter World. This is my first Monster Hunter game, along with a lot of other’s first dabble into the series as well. Capcom promised an easier overall approach, making it less intimidating for new players too. I’m not sure how well they actually managed this goal, but it’s still an interesting game to play. PREFACE: I’ve already reviewed Monster Hunter World for a different site for PS4. Most of the review is based on that, save for some of the networking changes I list below. Functionally, the PC version of Monster Hunter World ran great for me. I did have one or two instances where it wouldn’t load right, would just display a black screen and I would have to restart my PC but that happened only twice, in the dozen or so times I started the game. The framerate was solid, the game looks even better on my PC than on the PS4 and it’s a beautiful game, all around. It does require a lot of horsepower to run well, but if your computer can handle it, it’s a technically impressive game. Monster Hunter World starts you out as a new hunter of the fifth fleet sailing to the new world. In the opening, the boat you’re on gets attacked by a huge monster named Zorah Magdaros. And you quickly get separated from everyone else, save your partner. Don’t worry though, within 10 or 15 minutes you hook back up with the main expedition forces. Beginning your eventual quest to explore, catalog, and hunt down all the monsters you come across. This includes the mountain-sized Zorah Magaros that you meet in the intro. Once past the open, you create your own character. 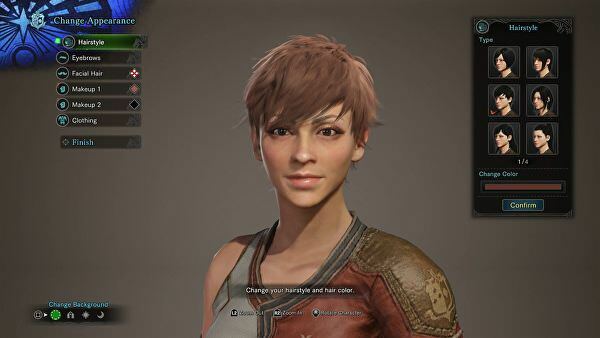 The Monster Hunter World character creator really shines. In most games, I tend to create very average-looking characters. But there is such a level of freedom in the MHW character creator that it pushed me to make something more expansive. You can fiddle with a lot of different parts for your player, and can create something really unique if you want to invest the time into it. 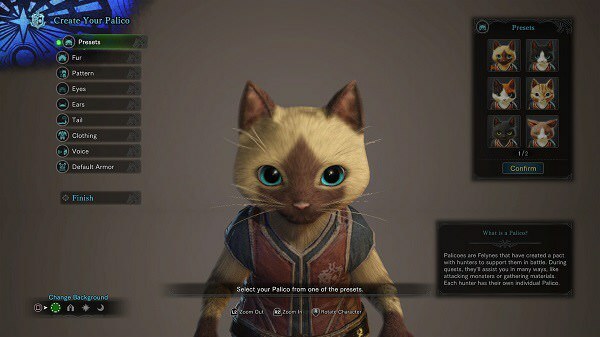 Also, you create your Palico who is your cat companion as you hunt. Yes, you fight with a bipedal cat for the game. He can cause damage, heal you, buff you, or throw grenades at monsters. There is slightly less freedom to create the Palico. I couldn’t adequately re-create my own cat like I’ve seen others do. But you can still create a unique Palico, if you want to spend the time to do so. With your character sorted, now it’s time to pick out your weapon. Monster Hunter World has 14 different classes of weapons. Ranging from sword and shield to dual blades. There’s even more esoteric weapons like a Switch Axe (ax that turns into a sword). As well as a metal bagpipe that can buff other hunters with you. The thing with Monster Hunter is that your hunter doesn’t actually gain new skills or abilities with weapons. You basically use the same combos and attacks that you start out with, 50 hours later, if you’re using the same weapon type. Mainly, you just craft and improve new weapons/armor, which is where upgrades come from. But, at any time you are free to switch a whole new weapon as well. While it won’t be as damaging initially, assuming you’ve leveled up your main weapon quite a lot, switching weapons can be just as effective, given enough time. There always a few steps to take before beginning a hunt. First and foremost, you should eat a meal before any hunt. Eating a meal at the canteen allows you to gain stat boosts through a large duration of a hunt. It does eventually wear off, but you can always break out your portable BBQ spit and roast some raw meat. Thus, regaining the bonus, if you can time the mini-game correctly. 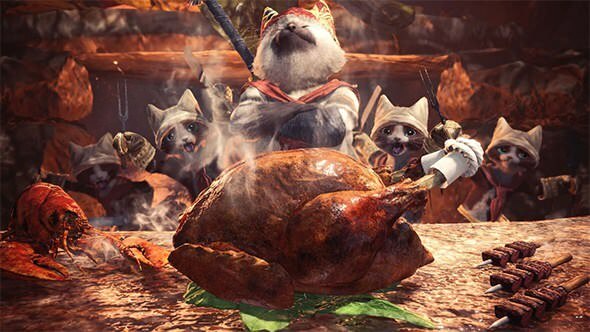 A collection of Palico chefs prepare your food, in a delightful cinematic, and the bonuses can range from increasing your attack damage to increasing you and your Palico’s health. Another important boost is one that reduces the elemental damage you may incur. Alongside eating meals regularly, you’ll want to check in with the bounty board every time you hit the home base. Bounties are like mini-quests you can do, as you hunt monsters or just roam around the environment. Basic ones are like “Mine six times”, or “Collect nine plants”, but these can quickly grow in complexity. For example, “Capture a Large Monster”, which requires a lot of planning. However, you can only take six bounties at once. So, know ahead of time what you can/can’t accomplish. Doing bounties nets you research points and armor spheres. Once you unlock them, Research Points allow you to cultivate plants in your garden. 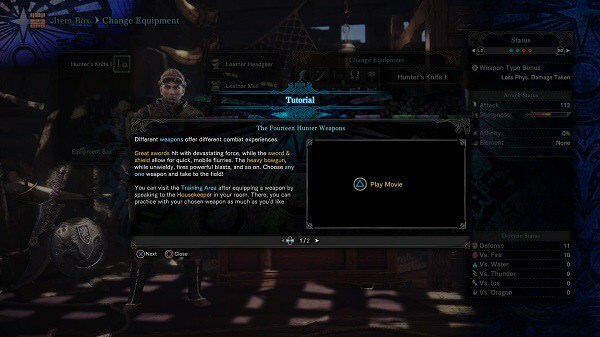 Plus, create new gear for your Palico, or even buy food at the Canteen, instead of using your money. Armor Spheres are what you use to level up your armor and make it better. Armor can gain up to 10 levels, which increases its defensive ability and effectiveness. You just have to feed it armor spheres, and some money, in order for the upgrade to take place. Hunts in MHW generally follow a pretty basic formula. You start off from camp and start trying to find monster tracks or other monster indicators. Soon, your glowing trail of insects (Scoutflies) begin showing you more of the monster’s impact on the world. Eventually, you’ll stumble across the monster itself, and the battle really begins. You and the monster fight across the landscape, with it likely running away a few times as it gets hurt, and you chasing it down. The main way to get at monsters is by wearing down its armor with your attacks and traps (if you have them). You’ll also have to dodge and heal from attacks the monster dishes out. Eventually, you kill the monster, and then you begin carving up its corpse to get materials you need. These materials help create the upgrades for new weapons and armor sets used by you and your Palico. Then, rinse and repeat for the next 50 hours, give or take. What I said above is a very surface-level summary of the gameplay loop in Monster Hunter World. This is because there are a thousand other things to consider before, during, and after the hunt. As you attack monsters, assuming you have a bladed weapon equipped, it gradually gets dull. Once it becomes very dull, it becomes ineffective and needs sharpening, mid-battle, with your ever-present whetstone. You literally pull a whetstone from out of your pack and rub your weapon against it four or five times to regain some of its sharpness back. You also have to be aware of the environment around you, as you hunt. There are numerous plants you can use to craft helpful things like potions or other restorative items that you’ll use in battle. There are some environmental traps like roots or precarious rocks to use against monsters. Finally, other monsters themselves can intrude on the hunt, for good and bad. For example, you might be hunting one monster, and have another completely different monster come swooping in and attack the monster you’re trying to take down. This is a good benefit, but if you tick off the other monster, then you may have a real problem on your hands, and have to fight both. There are a lot of other things to do. Both around the base and once you’re actually in the field. The base has the garden, as said above, which you can plant and cultivate certain herbs and mushrooms for you to use. When you’re in the field, there is a whole fishing mini-game for you to utilize. This allows you to get aquatic animals for resources. The biggest thing you’ll be doing though is picking up everything you can get your hands on during missions. 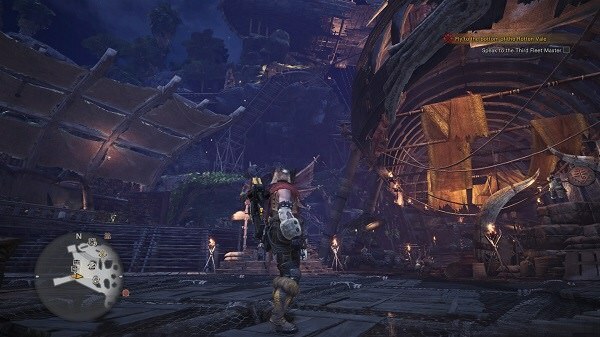 Then, using those resources for crafting potions, new upgrades for your weapons, and new types of armor for you and your Palico to wear. Your bags should be overflowing after just a few missions. After that, it is up to you to figure out who to best allocate those materials collected. Honestly, there is a lot to do in Monster Hunter World. I’m only barely scratching the surface here. There are additional delivery quests for you to do. Not to mention, timed quests as well. You can strengthen your “Kinsect” (which are bugs that can help you in battle.) Unlock new levels of research for monsters, which nets you more info on their strengths and weaknesses, and so on. There is only one problem though, and it’s kind of a major one. 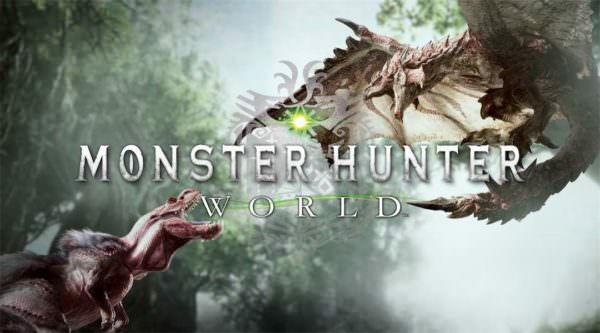 Monster Hunter World and the Monster Hunter series, in general, is designed to play with friends. 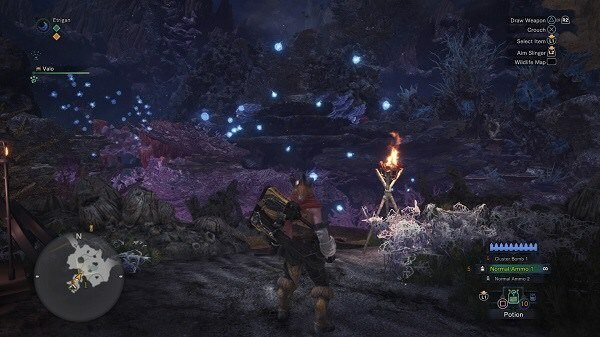 You can group up with three other people to take down various monsters. If your group has good synergy, it can be one of the most rewarding experiences in gaming. This is honestly where my PC review splits with my PS4 version. They did make it a tad easier to group with your friends, but not much. You still have to join or create online sessions with your friends to actually play with them, and it’s even more antiquated on PC than it is on console. The biggest difference I’ve seen, network-wise between the two versions is this: The mechanism for joining your actual friends on quests is slightly simplified. The game no longer assigns you a random string of letters and numbers, you can just type in what you want and then give that to your friends so they can join the quest. So…that’s cool. The downside is that the network code itself seems fairly unstable. I frequently got disconnected as I played the game from even an online lobby of just myself. It didn’t detract from the experience, for me, but if playing the game with a group of people is something you really want to do, you may have issues. There are the obvious positives when grouping with people. Whether it’s friends or randoms. However, there is also one negative. 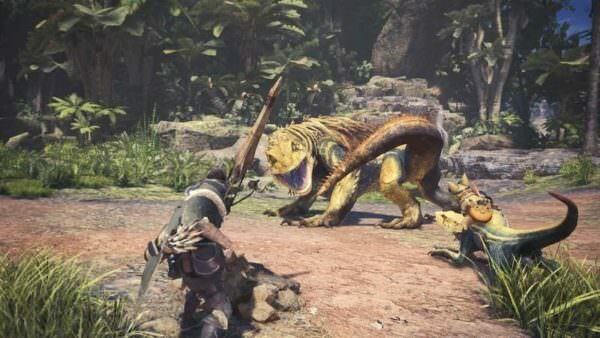 Monster Hunter World’s quests generally work on a “Get knocked out three times, and you fail the quest” mantra. However, this rule also applies to people you group with. So, if you are grouped with an inexperienced player, and they get knocked out, you also fail the quest. Maybe it’s just me, but a much better system would be, that if that player kept dying, they would be booted from the hunt. And then you could try to bring someone else in to help you. One last aspect I should mention is that the collision detection in this game is kind of gnarly. You’ll frequently clip inside monster’s large bodies at times, or get hit by something there’s no way you could see coming. It’s not a game-breaking issue by any means, but it’s something I did notice, especially if you try using one of the bigger weapons. Monster Hunter World is a bit like a Dark Souls or Bloodborne. It requires patience to really become a good hunter. If you just try to blindly hack and slash away at some Anjanath, you’ll get wrecked quickly. You have to prepare before a hunt, both In terms of your hunter and your gear. Hunts generally take upwards of a half hour, at least when you first start out the game. The PC version of this game is really solid and is a good port of the job.